The Washington Post has endorsed Dannielle Glaros for council ahead of the June 24th Democratic primaries for Prince George's County. The Post's Editorial Board released their endorsements on Friday, June 6, naming Dannielle among their list of candidates for the county. In their endorsement, the Post says Dannielle has, "broad experience in planning, transportation and environmental policy, including a stint working for former Maryland governor Parris Glendening. As a Council staffer, she has impressed many colleagues with her work ethic and attention to detail. She could be a leader on land use issues, which is at the heart of what the Council does." Read more about Dannielle's endorsement and other county council endorsements here. The Gazette Editorial Board has selected Dannielle Glaros among their top picks for the upcoming Democratic Primary. The Gazette, which has published weekly community newspapers in Prince George's County since 1959 and has a readership of 1.5 million people, put Dannielle among their "best bets" for the upcoming June primaries in Prince George's County. The Gazette's Editorial Board noted that Dannielle, "... has experience crafting legislation that directly impacts the district and has established relationships in the communities. In addition to her experience, Glaros has solid ideas on how to advance the county." The Gazette also noted Dannielle's commitment to the Purple Line, local business development with the University of Maryland, and her emphasis to promoting communities and highlighting the positive efforts made in municipalities. Dannielle said, "We're very pleased to receive this endorsement from the Gazette. It means so much to be recognized by such a great local newspaper." Almost every conversation I have had with a business owner, mother or granddad starts and ends with the need to strengthen our school system. Compared to the state and region, our school system—the 19th largest in the nation—has struggled. As the mother of two kids, I am invested in strengthening our public schools. This work begins with building strong neighborhood schools and hiring and retaining qualified teachers and administrators as well as a dedicated school team that includes nurses, counselors, and custodians. Delivering a quality education also involves enhancing parent and business involvement, improving school facilities, promoting smaller class sizes, expanding pre-kindergarten, providing parent liaisons as well as sufficient counselors for our kids, and working with nonprofits and the Parks and Recreation Department to provide robust after-school and mentoring programs. We have much work ahead of us and I am ready to roll up my sleeves and collaborate with the Board of Education, CEO, teachers, staff, and community to get it done. Prince George’s has the foundation to grow its economy and its job base. We have skilled residents, the University of Maryland, NASA, and other federal and state agencies, and numerous small businesses. However, unlike most neighboring counties that have gained back the jobs lost during the recession, we still lag behind. We’re moving in the right direction by working to attract large employers, such as the FBI, and to strengthen small businesses by giving them access to local contracts, but we can do so much more. Some of the best ideas, as well as the collaboration to make these ideas a reality, come when we all work together. Now is the time to be bold, innovative, and entrepreneurial. Thank you to everyone who came to our campaign kickoff event in Riverdale Park on Saturday, February 1. The weather was in our favor as more than 100 people from throughout our district gathered together to meet their neighbors and discuss the future of Prince George’s County. It was great to see everyone on what felt like a balmy afternoon for February. Dannielle’s fall fundraiser at Rinaldi's Riverdale Bowl was a big hit. About 100 supporters from throughout District 3 came to the lanes for a night of bowling, mingling, and food and drinks, and to hear Dannielle discuss her vision for the district. Everyone had a great time. A number of civic leaders and elected officials showed up to voice their support for Dannielle, including State Senator Paul Pinsky, Berwyn Heights Mayor Cheye Calvo, and Krista Williams, civic assn. president for Lincoln Vista. Read more and see photos from our fun day out at Rinaldi's. On Friday, I had a chance to experience first-hand what it feels like to be a fireflighter. Thanks to the MD Fire and Rescue Institute, the Prince George's Professional Fire Fighters & Paramedics Assn., and County Fire & EMS Department, I suited up in fire fighter protective clothing, donned a self-contained breathing apparatus, and actually went inside a real fire to experience firsthand the environment in which fire fighters work. WOW and thank you to all of our firefighters. I joined parents, teachers, and students at Berwyn Heights Elementary School's "Back to School Husky Night." This annual event brings together their school's community and is sponsored by the PTA. Hundreds of people came out for the big night, which included hot dogs, t-shirts for sale, music. A fun night for everyone. Other elected officials popped in for the event, including State Senator Paul Pinsky and Delegates Tawanna Gaines, Anne Healey, and Alonzo Washington. Berwyn Heights Mayor Cheye Calvo said a few words at the event. It was great to meet everyone and I look forward to working with PTA's across the district on more upcoming events. Dannielle hit the town for "National Night Out" this evening, visiting a variety of communities on a beautiful summer's night. 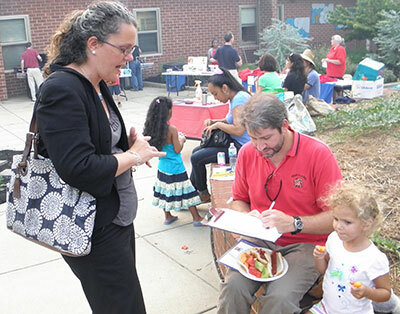 The threat of rain kept some away, but neighborhoods in Riverdale Heights, New Carrollton, Kingswood, Lincoln Vista, and Seabrook as well as many others were out meeting neighbors and sharing information. It was great to see familiar faces and sign up volunteers. "National Night Out" is a nationwide effort to celebrate the communities we're in and the people who help keep them safe. It is a great way to meet community groups and find resources. Many communities had food, music, and kids activities. Thank you to everyone who signed up to volunteer. We will be in touch very soon. Thanks again to everyone for a great evening!